Georgia is a country in the Caucasus region, on the boundary between eastern Europe and western Asia. 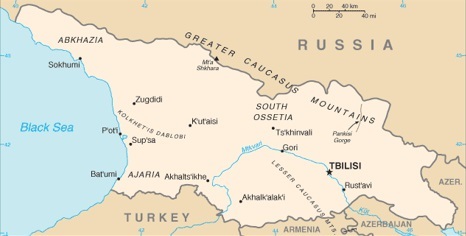 It shares land borders with Armenia, Azerbaijan, Russia, and Turkey, and also has a coast to the East on the western shore of the Black Sea. As of 2009, the population of Georgia was estimated as being 4,385,400. The country's capital and largest city is Tbilisi, which, as of 2006, had an estimated population of 1,480,000.